Book by Sheila Ruskin and David Wood. Music & lyrics by David Wood. Based on the verses and stories of Edward Lear. 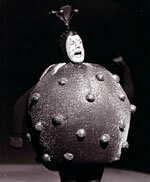 First produced by the Worcester Repertory Company at the Swan Theatre, Worcester for the Christmas 1968 season. Subsequently produced by most repertory companies in the UK, and many amateur companies and schools. Presented by WSG Productions Limited, the first London performances of the play were at the Jeannetta Cochrane Theatre or Christmas 1969. Many further Christmas West End season followed, as well as national tours produced by Cameron Mackintosh and David Wood, and Whirligig Theatre. 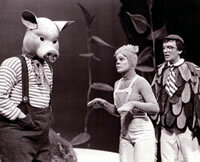 There have been many foreign productions of the play. 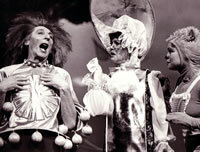 An LP recording of the show was released by Philips, featuring Harry Secombe, Roy Castle and Hattie Jacques. 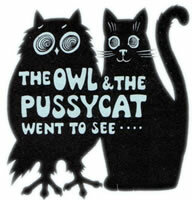 This enchanting musical play, based on the verses and stories of Edward Lear, tells of the quest of the Owl and the Pussycat to find a ring and someone to marry them. 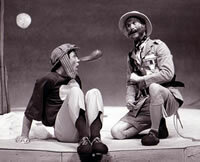 During their adventures, which takes them across the Syllabub Sea to Bong Tree Island and the Turkey who lives on the hill, they meet a host of delightful characters including the Quangle Wangle, the Dong with a luminous nose, Professor Bosh, the Runcible Spoon, the Jumblies – and the villainous, ever hungry Plum Pudding Flea. 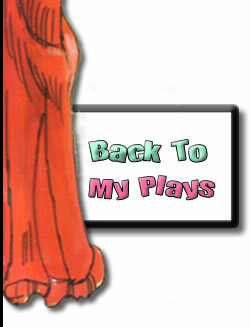 David Wood writes : This was the play that really started it all! Sheila Ruskin and I were acting in rep. in Worcester, when we were asked to write the Christmas play. Sheila played the Runcible Spoon. The play was directed by Mick Hughes, now better known as a highly respected lighting designer. I have written elsewhere about how I returned from acting in a season in Manchester, saw ten performances of THE OWL AND THE PUSSYCAT WENT TO SEE..., and was so knocked out by the experience that I decided it would be my mission to get the play on in London. This eventually happened, thanks to the help and collaboration of many colleagues and friends. It also led to the publication of the play by Samuel French Limited, who have kindly stayed with me and published virtually everything I have written ever since. It was particularly encouraging to see the Bristol Old Vic Theatre School production at Christmas 2001. After more than fourty years, the play, thanks to Edward Lear’s wonderful characters, has not really dated at all. Having directed it many times myself, but not for a couple of decades, I feel ready to revive it once more! 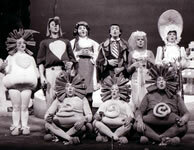 The original production featured twelve actors, with some doubling. Over the years there have been productions, notably at the Octagon Theatre, Bolton, using fewer actors, assisted by puppetry and clever doubling. The play and piano/vocal score are published by Samuel French Ltd. First Class Professional & Foreign Rights : Casarotto Ramsay Ltd. UK Repertory Rights : Samuel French Ltd. UK Amateur Rights : Samuel French Ltd. The play is included in David Wood : Plays Two (Methuen) US Stock and Amateur Rights: Samuel French Inc.